WATCH: Sherlock Victorian Special Trailer | Nerd Much? BBC One has released a new Sherlock teaser trailer for the upcoming Victorian-era special, in which we see the triumphant return of John Watson’s mustache. The short new teaser opens with a shot of authentic horse-drawn carriages, features some characteristic witty banter between Victorian-attired Holmes and Watson, and concludes with a dramatic recitation of Sherlock’s famed address. While the producers have kept a tight lid on the plot, we do know where they derived the title. The names of Sherlock episodes are often twists on names of actual cases from the stories, but this one comes from a casual reference Holmes makes in The Musgrave Ritual :”Ricoletti with the club foot and his abominable wife”. We also know it takes place in the year 1985, which is an important year throughout Conan Doyle’s stories. 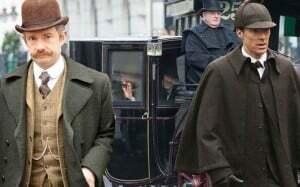 Although Benedict Cumberbatch was made for period dramas and looks rather dashing in Victorian-era costume, the show will return to the modern era following the special. Series 4, however, is at least another year away, so hopefully this one-shot will help tide fans over. After all, Series 3 concluded in early 2014. The Sherlock Holiday special will premiere on January 1, 2016 on BBC One. Stay tuned to Nerd Much for further Sherlock coverage.